Looking for a surprising, yet very affordable Christmas gift for your BFF, mom, niece, aunt or sister? Yves Rocher is the place you need to be! Next to the beneficial effects of the herbal ingredients of the Yves Rocher products, the items are really soft priced and look trendy and glamorous. 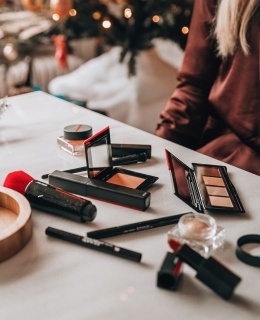 I’ve been testing some products for a few months now and I’m very happy to share my Christmas favourites with you! I’ve exchanged my trustworthy Labello’s for these glossy lip pens ever since I started using them! They give me the same moisturising feeling of my lips but add a little extra thanks to the wide range of colours, with the ‘Sable Doré’ being my favourite. Available here. The fragrance is warm and feminine, just how I like my perfumes in Winter! Wrapped in a beautiful giftbox with matching shower gel and body cream, this makes the perfect present! Available here. People who know me in real life might have heard me brag about these nail polishes! These are honestly the best I’ve ever tried and believe me, I’ve used litres of polish ever since I was 15 years old! The brush is thick but yet still flexible enough to cover all parts of your nail, the colours dry really really fast but most importantly (and this used to be my issue with every other brand I’ve tried before – even Chanel) the nail polish stays on your nail for at least 5 to 7 days without chipping! I can only say amen to that! Available per colour or in sets of 3 or 6 colours here. De glossy lip pen wil ik wel eens proberen! Ik ben erg fan van dit soort producten.